 Editor's note: Lord Murugan is well known as the adi guru who transmitted the Tamil language together with its mysteries long ago to sage Agastya Muni, who in turn shared it with humanity. This article by a learned Sri Lankan devotee explores the legacy of Lord Murugan's great disciple. A rare and illuminating book in English on the life and works of the great siddhas of ancient and modern times, with particular reference to Śrī Agastiyar, the archetype of all siddhas and gurus, was published in Canada recently, entitled Babaji and the 18 Siddha Kriya Yoga tradition, written by Marshall Govindan, an advanced Kriya Yoga sadhaka of Los Angeles and a keen scholar, who had carried out extensive literary and spiritual research in India and Sri Lanka for twenty years under the guidance of Yogi S.A.A. Ramaiah. In the hierarchy of siddhas or perfected human beings, or Initiates of the White Brotherhood as they are called in the West, who have guided the destinies of nations on our planet Earth for the past 12,000 years of recorded history, the ageless legendary siddha Śrī Agastiya Maha Muni stands out as the senior-most guru who initiated a galaxy of eminent gurus and siddhas down the ages, and who had established and nurtured the ancient Dravidian civilization lasting several millennia. He is also acknowledged, in occult circles, as the head of a representative group of rishis entrusted with the guiding of the destiny of India and other nations called the Sapta Rishis as disclosed in certain ola leaf manuscripts called rishi vakyams and also in theosophical writings. 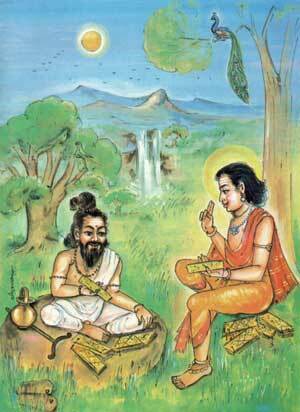 #346;rī Agastiyar is also considered the author of several Rig Vedic hymns in Sanskrit connected with the Aryan civilization of the North. In the Ramayana saga, which is deemed by historians to have taken place about 9,000 years ago in the Treta Yuga, Śrī Agastiyar is reported to have appeared before Rama himself on the day before the final victorious termination of the war with Ravana, the hitherto invincible King of Lanka, and initiated Lord Rama with a special divine mantra to counter the effect of the powerful boons that Ravana had earned from the gods by his great tapas. It is significant to note that, according to geo physical research based on the movement of the continental plates, the Lanka of Ravana was situated in the continent of Lemuria, also known as Kumari Kandam, which was a land mass, connecting the Deccan plateau in South India and the island of Ceylon, with intervening straits to be crossed, with Madagascar in the West, Australia on the East and Antarctica on the South, until it sank into the Indian ocean in stages over 3,500 years ago, as mentioned in the writings of the German geologist Wagner anti the eminent Indologist Sir T.W. Holderness. The research done by Fr. Heras and Sir John Marshall the archaeologist and other scholars into the archaeological finds at Mohenjodaro and Harappa point to the existence of an earlier highly developed Dravidian civilization in the deep South which, had influenced the Indus-Valley Aryan civilization of the North. The available historical evidence referring to the Dravidian civilization commences with the records that have come down to us of the Tamil literary writings during the past 12,000 years, which have been divided by historians into three periods, called the First Sangam period from 9600 BC to 5200 BC, spanning the Satya and Treta yugas, the Second Sangam period from 5200 BC to 1500 BC spanning the Treta and Dwapara yugas, and the Third Sangam period from 1500 BC to 600 AD spanning the Dwapara and Kali yugas. According to the present cycle of four yugas, namely Satya, Treta, Dwapara and Kali yugas, in their descending arc of 12,000 years and ascending arc of another 12,000 years, as stated by Śrī Yukteswar in his famous treatis called ‘Holy Science', we are now in the ascending arc of Dwapara yuga completed the Kali yuga period lasting from 600 BC to 1800 AD. The Mahabharata war, where Lord Krishna propagated the teachings of the Bhagavad Gita to Arjuna, is reckoned to have taken place during the Second Sangam period about the year 3100 BC. The First Sangam, which was founded and nurtured by Siddha Śrī Agastiyar, lasted for 4,400 years and had its centre in the city of Dakshina Madura in the continent of Lemuria. The Second Sangam, which was also established under the patronage of Śrī Agastiyar, lasted for 3,700 years and had its centre in the city of Kavatapuram in the continent of Lemuria, after the records in the city of Dakshina Madura had gone under water. The Third Sangam, also sponsored by Śrī Agastiyar, lasted for 1,800 years and had its centre at Uttara Madura, namely the modern city of Madurai, which lays north of the earlier centres, after the whole of the Lemurian continent had gone under water. After the commencement of the gradual inundation of the Lemurian continent, it is reported that Śrī Agastiyar led a migration of Dravidians to Java and Cambodia and Central and South America. The legends of the Incas, Mayans and Aztecs of South America regarding the founding of their cultures by tall beared white-robed teachers confirm the tradititional view that the Lemurians, under the guidance of their siddhas, colonized North and South America, as well as the Nile Valley, when they founded the Egyptian civilization. It is significant to note that Edgar Cayce the well-known ‘sleeping prophet' of America, had in the course of his recent voluminous psychic messages given out by him while in a state of trance mentioned a similar sinking of the continent of Atlantis in stages into the Atlantic Ocean over a period of several centuries between 12,000 BC and 10,000 BC, before the sinking of the Lemurian continent. Maha Avatar Kriya Babaji of the Himalayas, the lineal Guru of Paramahamsa Yogananda, Yukteswar and Lahiri Mahasaya, who is well nigh 1,800 years old today, still retains a young physical body of a 16 year old youth, as a result of his divinising the cells of his physical body, after receiving initiation from two of the greatest siddhas of all time. Siddha Boganathar instructed him in the higher Kriya yoga techniques, for six months at Kataragama in Sri Lanka in the year 214 AD and sent him thereafter to his own Guru Siddha Agastiyar at Couttalam in India, where Babaji had the final initiation in Kriya yoga, after he had practised severe austerities for 48 days to invoke the grace of Agastiyar, who finally appeared before him in his physical body emerging from the adjoining forest; and showered his full blessings on him. These facts were disclosed by Babaji himself in 1952 to two of his disciples V. T. Neelakantan, a Theosophist of the early days, and Yogi S.A.A. 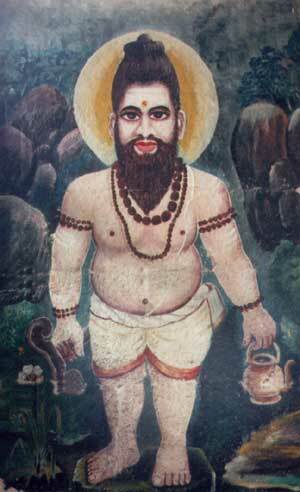 Ramaiah, when he materialized in physical form from his abode in the Himalayas in the shrine room of V.T. Neelakantan at Suramma1 Lane, in Egmore, Madras. In.turn Babaji is known to have initiated among others the famous Hindu reformer Adi Sankaracharya into the mysteries of Kriya yoga about the year 800 AD. Among the several Siddhas initiated directly by Śrī Agastiyar were, according to certain sources, (1) Tirumoolar, the author of Tirumanthiram described as one of the greatest texts of yoga and mystic truth ever written, who lived for over 3,000 years in the pre-Christian era, and (2) Tiruvalluvar the author of the world famed classic scripture the Tirukkural, who lived 2,000 years ago. enabling the physical body to be placed in a tomb in jeeva samadhi at will, in a state of suspended animation, where the blood circulation and the breathing have stopped but a luminous pranic energy keeps the body-cells alive, with the possibility of the siddha dematerializing the body in the tomb and materializing it outside in a completely different locality and living out an extended span of life for several years (as in the case of three well-known siddhas of modern times, namely Śrī Raghavendra Swami about whom a popular film had been made recently, Śrī Kulandaj Ananda Swami whose last jeeva samadhi is in Madurai city and Śrī Muthukrishna Swami whose jeeva samadhi is in Vallioor). The writer of this article had the opportunity to view and pay homage at the shrines, where the latter two jeeva samadhis are situated.